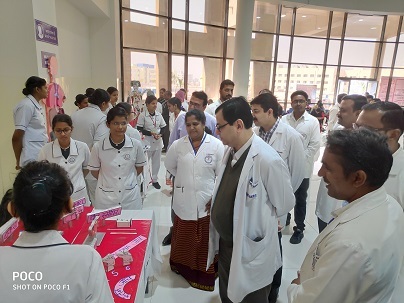 World Cancer Day was observed by AIIMS College of Nursing in collaboration with Department of Radiotherapy, on the theme “I AM & I WILL” on 4th February 2019 which was inaugurated by Honorable Director Professor Dr Nitin M. Nagarkar. Cancer is a preventable disease and everyone has the capacity to address the cancer burden, provided we are adopting healthy life style practices, early screening and treatment for it. On this occasion poster and model exhibition was conducted at Dome 1, new OPD, AIIMS Raipur. The exhibition focused on increasing the physical activity, avoiding substance use like smoking and alcohol, healthy dietary choices by avoiding junk foods, healthy sexual practices, avoiding UV radiation by sun exposure, reasonable use of electronic devices and efficient ways of stress handling are the main ways of prevention of cancer were reinforced among the public attending. 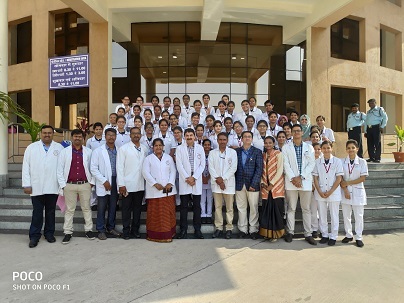 A Continuing Nursing Education on the theme “I AM & I WILL” was conducted in College of Nursing for Nursing Faculties, Nursing Officers and Nursing students. 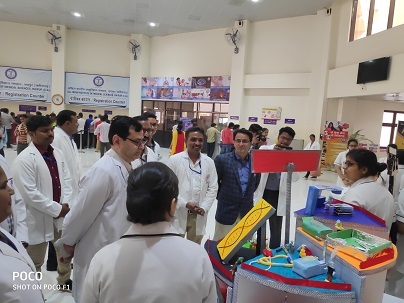 The program was guided and supported by the Honorable Director Professor (Dr.) Nitin M. Nagarkar, Dean Dr. S. P. Dhaneria, Head of the Department of Radiotherapy Dr. Siddhartha Nanda and Assistant Professor College of Nursing Dr. Binu Mathew and Mrs. J. Jeayareka.